The economy is in the forefront of everyone's mind these days, and it is no different in the design world. Designing economically with tile and stone is always a good strategy. It is important to respect today's often shrunken budgets by keeping tile costs down while not sacrificing design style and aesthetics. I would like to share with you some great tips to keep your tile budget in line. Select a tile or stone floor that is less expensive than the wall tile. Keep higher cost items at eye level and in the more visible areas. When you enter a room, you typically notice what is directly in your line of vision. Most people do not look down at the floor. Use inserts to make the floor look more important for very little cost. Place small inserts of tile that compliment a rug, wall paint or wall tiles in the floor. This is a very effective design strategy to connect the floor with the walls or other design focal point. Avoid linear designs using moldings and liners. Avoid linear designs by using tile inserts. This allows design flexibility in placement which can keep costs down. Always use the most economical field tile available from the line being designed with. 4"x4"s and 6"x6"s are typically the most economical sizes. Avoid small sizes and fancy shapes when budget is a consideration. Consider mixing a well priced stone field tile with matte glazed ceramic accents and moldings. Stone field can often be less expensive than handmade ceramic field tile. The mix of stone and ceramic can create a dynamic textural design. Only tile up to 36" on a wainscot, instead of 42" or higher (but always to the ceiling in the wet areas). With color and tile direction - don't use more costly sculpted or handpainted tile pieces. Lots of design interest using basic and economically priced tile sizes. Create a small-scale, but dramatic, "feature area" where it will have the most design impact while keeping the field tile, trims and floor simple and inexpensive. Small-scale feature area (above sink), normal-height wainscot, & no molding or trim keep tile costs down. Use color blocking and inexpensive tile or stone for lots of design drama with little cost. NEVER suggest eliminating tile on a bathroom wainscot as a cost-saving solution. It will look like corners were cut and the design not well thought out. Select a good-looking, less expensive line, perhaps machine-made rather than hand-made, rather than leave walls un-tiled. Tile trim solutions Tile trims, whether ceramic, glass or stone, are often quite expensive, especially if they are shaped or highly decorative. Careful selection of tile trims is a successful budget solution. Use bullnoses for trim and an inexpensive liner as décor instead of more expensive moldings. Quarter rounds also can be quite inexpensive, use them to turn corners where needed. When it comes to design, it helps to have a great idea. Turning dreams into reality does require hard work and starts by writing down what you want and what is important to you. Before starting any project, define your goals. The best ways to do this is to discover what is important to you — even before you start tearing out magazine pictures of what you want your finished bath to look like. This step helps you and design professionals make the right decisions as they relate to cost, budget and material selection. Here is a great worksheet to help you start discovering what's important to you. This checklist was designed by Sunny McLean and can be found in her very helpful workbook, The Basics, which is a great tool designed for folks in the tile and stone business. Sunny McLean has been in the tile business for years and now provides consulting services to the tile trade. This checklist or questionnaire, was completed by one of our customers and resulted in the project we featured earlier this summer in our Designer's Sketchbook, Bath with Bordeaux Cement Floor Tile & Crackle Wall Tile. What kind of experience do you want from your bath? Check those that apply and discuss with your family, designer or tile dealer so that can help guide you the best choices that will make you happy for as long as you use your bathroom. What it looks like has to please more people than the just my family and me. All items, plumbing, tile and accessories are chose with great care for design impact. Stop talking! Take some time to discover your dream bath. This important, first step, will help ensure your dream comes true! www.tileheritage.org. Scroll to find in books. http://store.bnpmedia.com/store. 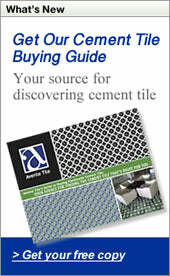 Once in AEC Store, click on "tile" on the lefthand side, scroll to find. Our blog has taken a lower priority recently with summer vacation and longer days. So has the time spent with my friends on Facebook and Twitter. As I was trying to get back in the swing last week, I was reading blogs and twitter posts from friends. Nick Lovelady posted a comment to Paul Anater about "drag queen bathtubs." That caught my eye and I read Nick's blog, Cupboards, and Paul's Blog, Kitchen and Residential Design. This started a flurry of comments and somehow by the end of the day I was responsible for a blog-off where several bloggers write about the same topic. The tiled shoe bathtubs are made by SICIS (a well renowned mosaic tile company) and look like a ladies' pump in the size of a tub. I am sure the tiling is exquisite. The price: about $30,000. I'm all for self-expression especially when using tile. These tubs do it! Are they ostentations and over the top? Absolutely! Do you really need one? No. But, if you do. Please let Nick know! Your thoughts? Let us know. Leave a comment. Read the other blogs about this topic that are listed below. Read their blogs to get their unique perspective on this unusual product.